Puerto Portals is the resort most popular with the rich and famous! 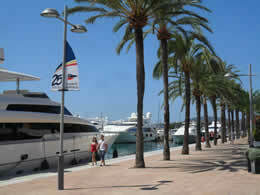 Puerto Portals, a stylish fashionable resort close to Palma, has grown in size steadily over the last decade. This is largely due to the popularity of the Portals Marina where you will see a multitude of Luxury Boats, Superyachts and incredibly expensive Vehicles. Needless to say that the area is frequented by the rich and famous who come to enjoy the gastronomy of Mallorca and shop for the latest fashions in the Designer stores. 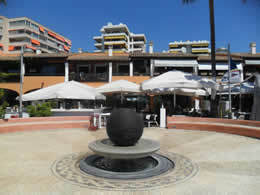 The Port, similarly styled to that of Puerto Banus in the Costa del Sol, has a very impressive range of International restaurants which line the exclusive harbour. 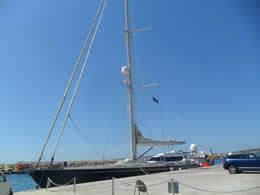 Many tourists enjoy people watching at the Marina, trying to spot celebrities or wealthy people while admiring the Luxury Yachts berthed there. 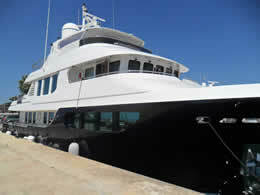 The Marina is a fair size (670 berths) with visitor berths available and guest berths available. Very often you will see many boats waiting in the bay of Palmanova until a berth becomes available. 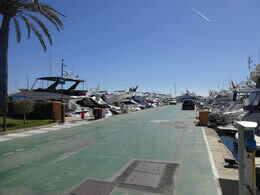 Portals has a time control entry system, take a ticket as you drive down to the Marina. There is an option to park to the right hand side of the road or you can travel along the one-way system until you reach a large car park at the far end. 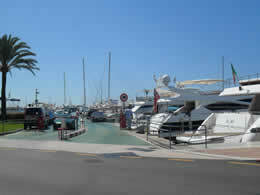 There are two beach areas, a small beach at the start of the Marina and the other larger beach is at the end of the walk-way. 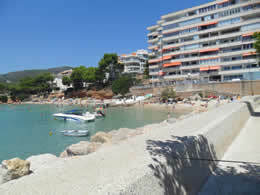 The small beach is popular with tourists and locals. From this beach, you can see over to Palmanova at the opposide side of the bay. This beach can be crowded especially in Summer however many people prefer it because they can enjoy watching the boats/yachts of all sizes travelling in and out of the Marina. A range of elegant restaurants, bars, shops and designer boutiques line the Marina and in the evenings it comes alive with an almost electric atmosphere. Puerto Portals has been the venue for several major yachting regattas, vintage car reunions and several exhibitions over the last few years. Many of the restaurants in the Marina have special lunch menus but if you wish to dine in the evening, we recommend that you reserve a table in advance. One of the best known restaurants is Flannigans. Cappuccino Cafe has a prime position at the Marina serving everything from breakfast to evening meals. Although most of the restaurants at the Marina are expensive, you can also find some inexpensive dining options. 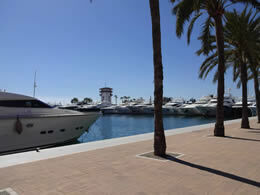 You can stroll around the Marina and admire the Boats, Cruisers and Yachts, indeed you will also see some very nice vehicles parked alongside. When we went there for coffee, we bumped into Peter Stringfellow who was just leaving the Marina. Both Puerto Portals and neighbouring Portals Nous have a good range of Hotels and Apartments to offer. Portals Nous, on the hillside above the Port, also has some small Shops, a large Supermarket and several Cafes, Bars and Restaurants. 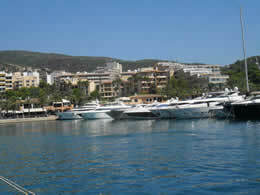 You will find many British people, who live in the surrounding area, shopping there and throughout Calvia. I was lucky to get parked here!! In Winter months the area can be busy with residents who also enjoy coming to the area to enjoy the Restaurants or to people watch at the Harbour. 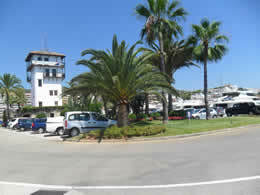 Puerto Portals is a resort to well worth a visit, distinctly different to any other in Mallorca!